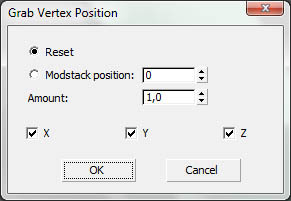 Here you can partially reset vertex positions, or grab them from somewhere in the modifier stack. Please note, that the grabbing of vertex positions only makes sense, if the topology is not changed between the modifiers. If the vertex order changes in between, you won't get acceptable results. Modstack position: chooses to grab from the modifier stack. The spinner has two possibilities: zero or positive values are absolute positions in the modifier stack. 0 is the base object, 1 is the first modifier, 2 the modifier above and so on. Negative values are relative to the stack position of the current MeshAK modifier: -1 is the modifier directly below the current MeshAK, -2 is below that and so on. Amount: Sets the amount, by which the vertices' positions are reset/grabbed. 1 means complete influence, 0 zero influence. X, Y, Z: Here you can except one or more axes from the influence.